My style to Sambal Tumis Ikan Pari? Different. Not the standard sambal kinda and stingray in one. Why? Haha! Basically I blended the ingredients for sambal (Assam Fish Curry, Chilli Soy Fish & Sambal Bilis Petai) and this raw sambal (Fried Kembung Assam Sauce) tipped over stringray placed on banana leaf and cooked by placing the wok/kuali lid atop. That's its foodies and the outcome? Our Malaysian Malay style to cooking ikan pari/stingray. Our Malaysian herbs scented, spicy and tangy Sambal Tumis Ikan Pari. 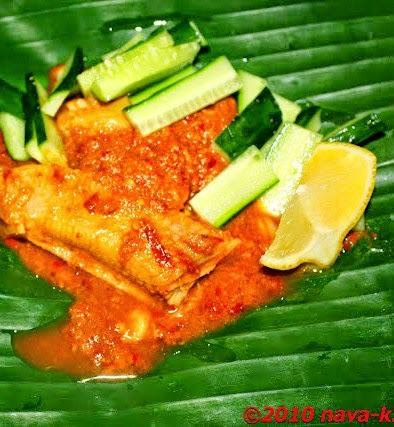 In a non-stick pan, place banana leaves, drizzle oil, add sambal paste and place the fish over. Place another piece of banana leaf atop , gently press over fish and cover with lid. Then turn to cook the other side.